One of my dear friends is turning 30 on July 5th, and is planning a backyard bbq and pool party with family and friends, deep in the heart of Texas. 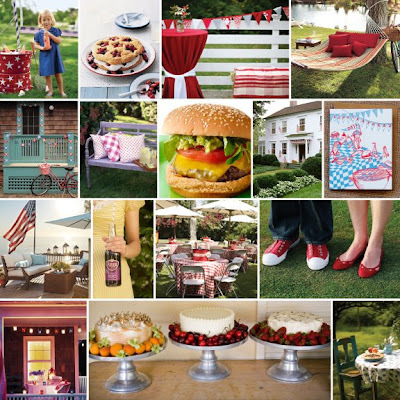 I thought it only fitting to give her some inspiration for a classic, all American, red white and blue summer celebration. Hopefully it'll give you a jump start on those July 4th plans too. Enjoy your summer Sunday... and a happy Father's Day shout out to dads everywhere! Resources: hammock & lounge chairs via pottery barn; girl, shortcake, bench and porch scenes via martha stewart; red shoes, backyard tables and pennants via flights of fancy; burger via bobby flay; card via hello lucky; soda via project wedding; cakes via the brides cafe, chair with pie via sweet paul. Great inspiration board! We celebrated the 4th last year in Boston...which was Americana at it's best! So fun!